President-elect Donald Trump’s unprecedented phone call with Taiwan’s newly-elected president Tsai Ing-wen has a lot to do with Washington’s often complicated military tensions with Beijing. Why? The South China Sea, a disputed swath of ocean of which China claims a majority of territory. It is true, as Trump mentioned in his tweet, that America sells billions of dollars in arms to Taipei; President Barack Obama approved $1.83 billion in sales to Taiwan in December of 2015, as we pointed out yesterday. Washington has been selling arms to Taipei for more than 30 years. What is different about Trump’s call is that no U.S. president has even spoken to a Taiwanese leader since 1979, when Washington established full diplomatic relations with Beijing. Trump, by the way, says he accepted the call from Taipei and, of course, Taipei says it was arranged ahead of time. Either way, Washington has an uneasy balancing act to maintain workable relations with China, while securing its military might in the South China Sea with Vietnam, the Philippines, Taiwan, Malaysia and Brunei—all of whom claim portions of the sea. Given that Beijing boasts the most powerful military of all those competing Asian interests, it is feared that China will monopolize the body of water and all of the trade that comes with it. So why are they beefing over the South China Sea and what is America’s role in it? The answer is simple: natural resources and trade. More than $5.3 trillion in trade travels through the South China Sea, according to the Council on Foreign Relations. America makes up $1.2 trillion of that figure. If any conflict were to arise between either of the competing nations claiming certain parts of the sea, it would disrupt cargo delivers and diverted paths could risk billions in lost capital and increased insurance costs. 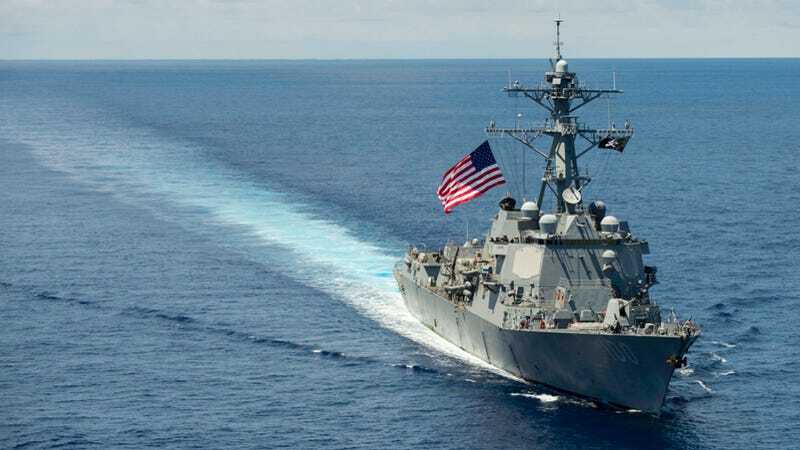 It is important to note that the U.S. military has deployed a robust showing of destroyers and amphibious assault ships on navigation missions in the South China Sea to contest China’s claim of sovereignty. China has responded in the past by having its own destroyers shadow U.S. ships. What’s more, China has been building artificial islands in the contested territory to cement its claim to the area. In January the first photos emerged of China operating aircraft on a runway at Fiery Cross Reef, which is capable of supporting fighters and military transports. Furthermore, there is additional evidence China is installing a high-frequency long-range radar array on another one of the manmade islands in the region. There’s a lot going on and one has to wonder if Trump’s team is considering how delicate the military tension is in this highly contested body of water in light of expressing unprecedented overtures to Taipei. The court concluded that Chinese efforts to create man-made islands on top of atolls and reefs, as well as its large-scale fishing in the disputed areas, are illegal. China’s interference with the Philippines’ fishing and oil exploration of the region is also unlawful, the tribunal said. “The award is breathtaking in its scope and the degree to which it gives long-needed clarity to the law of the sea,” Peter Dutton, professor and director of the China Maritime Studies Institute at the U.S. Naval War College, told CNBC. The so-called law of the sea is a set of global standards that affect every ocean-going country. Wang largely blames America and Australia for what he calls their “conspiracies” to cause trouble in the region over the South China Sea. It’s tough to say how Trump plans to maintain cordial diplomatic ties with China while standing up to them over what he says is their devaluing of America’s currency. Very little time was devoted to international affairs during primary and general election debates. U.S.-China relations are not as simple as Trump makes them out to be. It is a contentious relationship that requires both strength and nimbleness, the latter of which Trump’s Twitter rants reveals he has little understanding or use of. At some point, Trump’s bluster over China must be followed with a philosophy on how he understands diplomacy with China. But, his Twitter rants and sound bites are more entertaining than informative of his China policy. That leaves America and its allies at risk of getting caught up in the crossfire.